Thread: How Can I Make Quilt Out of Wall Hanging? My son recently moved into a high-rise condo and has asked for a new quilt. 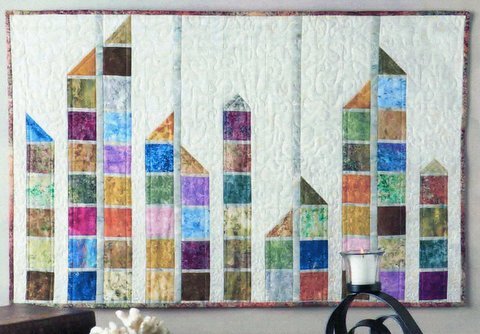 I purchased a great wall hanging titled, "Concrete Jungle," because it reminded me of high-rise buildings. How can I make a quilt out of this wall hanging? I thought I could make the wall hanging, but add enough of the background fabric all around it to make it a quilt. The wall hanging is 32 in. by 20 1/4 in. The quilt needs to be 72 in. by 88 in. Any thoughts on how to make a quilt out of this? Is it a pattern or a finished wall hanging? If a pattern, you could make the high rises wider by duplicating some of the "buildings." If it's already finished, I could see it as a stripe on a solid color quilt. Or put something like Central Park in NYC below it. Or put coordinating color stripes at intervals below it, based on your son's color choices. Last edited by nativetexan; 06-13-2013 at 07:12 PM. Turn it 90* into portrait.more square blocks upwards and you could also put 2 or 3 across. And use possible charm pack . It is only the top of each building need to alter flats tops . Look. At a sky line picture of New York it may he. Hope you can understand it is clear to me as yours is. Helping me figure my skyline I have been planning or a year. Why not make a quilt using the wall hanging as your inspiration! Then give both to your son. Put borders on it and then put more buildings, another border or two to get to the size you want. OR, put on border or borders with a strip of building colors and finish with border or two. Thanks so much for the suggestions. Holice, I meant to say I purchased a pattern for the wall hanging. I would enlarge the pattern first and then make the buildings taller, by adding some blocks at the bottom. Then you could add a base on it like a street or something like that and then finish the size with borders all around. Maybe if you made everything twice as large as the pattern calls for. You may need to add other rows to make it wide enough. Then, because the rectangle goes the wrong way for a bed, add the background fabric to the top until it is long enough to cover the bed. Use as the centre piece. The outside could be sky lines of different cities in black on a coloured back ground. Thanks so much for the suggestions. I'm still not exactly sure what I am going to do, but you have given me some great ideas.